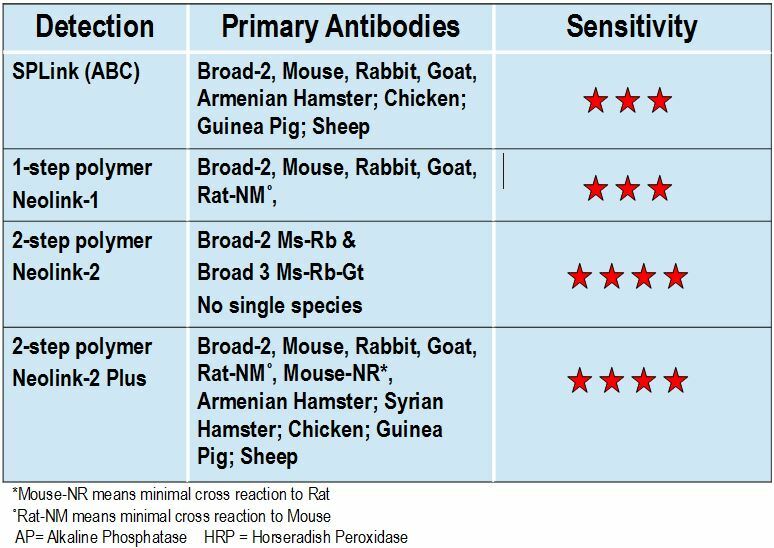 4 categories of detection kits for detecting Mouse, Rabbit, and Goat primary antibodies. Products are tested on paraffin embedded human tissue for manual stain and auto-stain. HRP and AP kits use the first generation of polymer technology that offer quicker turnaround time (15 minutes) than biotin-streptavidin detection systems. It does not require a blocking step. This system yields high signal to noise ratio and eliminates background caused by endogenous biotin. 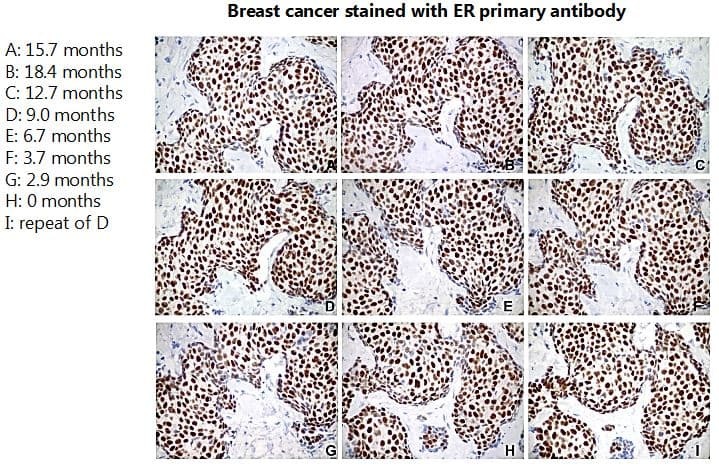 It is designed to use with mouse and/or rabbit antibodies to detect antigens in human tissue or cell samples. Choose from AP, HRP-AEC, or HRP-DAB kits in following table for your chromogen preference. HRP and AP kits ae 2-step polymer detection kits that use the second generation of polymer technology, a proprietary polymer helper and polymer HRP or AP conjugate to achieve super sensitiviity. 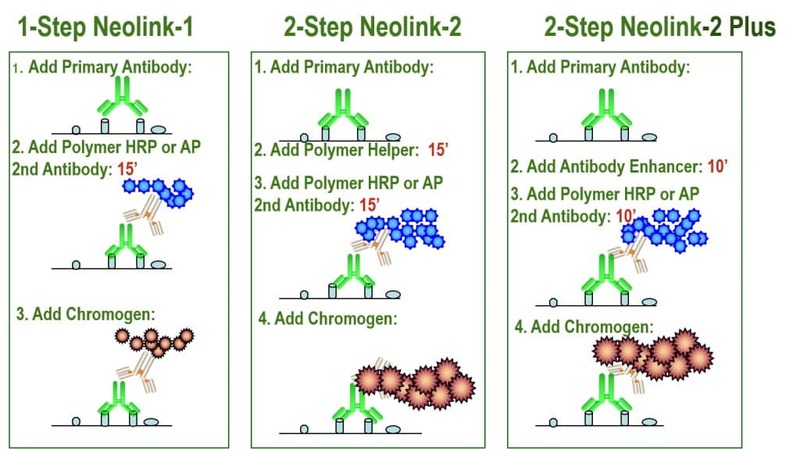 Neolink-2 system is 3-4 times more sensitive than 1-step polymer detection kits. 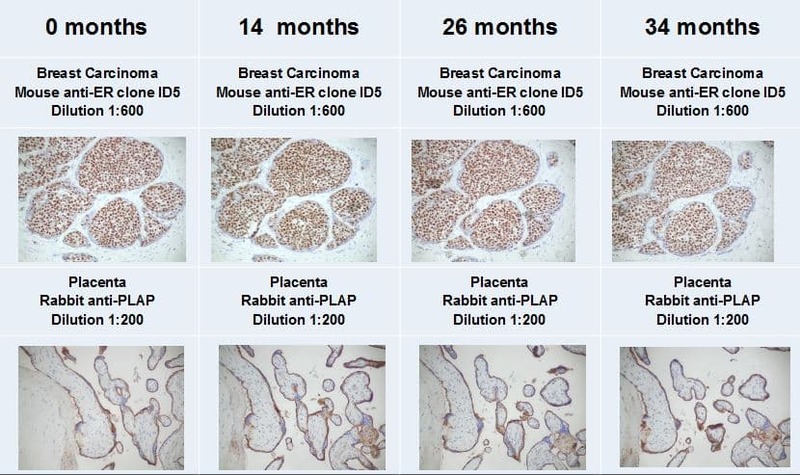 It is designed to use with mouse and rabbit antibodies (Broad-2 kits) or mouse, rabbit and goat antibodies (Broad-3 kits) to detect antigens in human tissue or cell samples. HRP and AP kits "Plus" use the third generation of polymer technology, a proprietary polymer enhancer and polymer HRP or AP conjugates to achieve super sensitivity. The Neolink-2 Plus polymer detection system is more sensitive than most other 2-step polymer systems available. Requiring only two 10 minutes incubation, it is designed to use with mouse and/or rabbit antibodies to detect antigens in human tissue or cell samples.